Standard crib size - 28” x 52” x 8"
Designed to mix and match, this crib sheet creates a comforting nest for baby's first dreams. 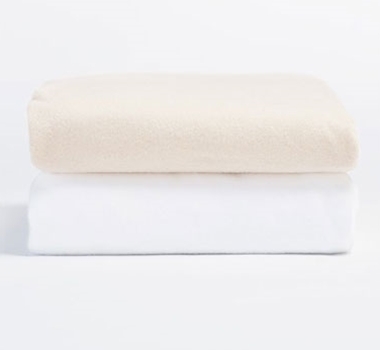 Soft organic cotton flannel softens with every wash. Designed to fit securely and snuggly on any crib mattress with a full elastic and 8" pockets. These sheets are machine washable. For whites and light colors: We recommend machine washing on the gentle or delicate cycle with warm water and non-phosphate soap. For dark colors: We recommend machine washing on gentle or delicate cycle with cold water and non-phosphate soap.